Mazarine Treyz has been featured on national syndicated media, including Fundraising Success Magazine, The Chronicle of Philanthropy, Philanthropy.com’s Fundraising Fundamentals podcast, Fundraising Success Magazine,Tony Martignetti’s Nonprofit Radio show, and the Career Clinic with Maureen Anderson. Interviewed by Carmen Carrozza on Rockstar Radio Network January, 2013. Interviewed by Meghan Schiebe of Travel Volunteer Search on the radio about why people give to your nonprofit in June, 2010. Desiree Adaway wrote about Fundraising Rockstars, our project together, September 2011. 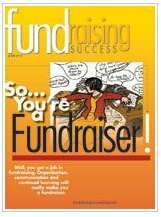 Sandy Rees wrote about Fundraising Rockstars, our project together, September 2011. Jessica Journey wrote about Fundraising Rockstars too! Amy Sample Ward featured The Wild Woman’s Guide to Fundraising book on February, 2011.
iGrad article on how to get a nonprofit job for new graduates. Article on how to overcome workaholism over on the Fundraising Ideas blog!